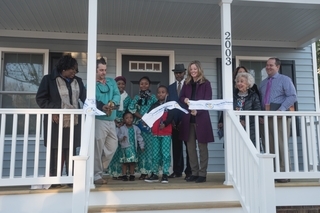 NEWPORT NEWS, Va. (Jan. 31, 2019)--Huntington Ingalls Industries’ (NYSE:HII) Newport News Shipbuilding division hosted a ribbon-cutting ceremony on Wednesday for a new home company volunteers built in collaboration with Habitat for Humanity Peninsula and Greater Williamsburg. The company also broke ground on its 17th joint project. 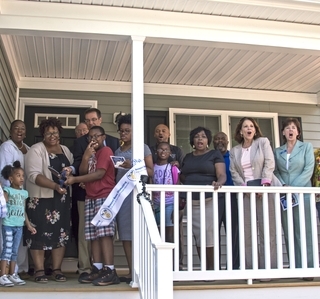 Newport News joined elected officials and community leaders in welcoming Salima Kabwe and her three children to their new home in the city’s southeast community. The three-bedroom house is the 16th constructed since 2002 when Newport News first began working with Habitat. 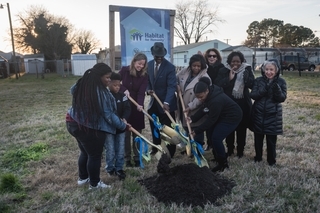 “Like the aircraft carriers and submarines we build at the shipyard, these Habitat for Humanity homes are built with purpose, and they are built with pride,” said Jennifer Dunn, Newport News Shipbuilding’s vice president of communications. “We are proud to lend our support to these projects. “Each Habitat home is unique in its own way, but this home holds a special place in our hearts, because, at the time we broke ground on it last year, we said good-bye to a member of our shipyard family and the Habitat for Humanity team,” Dunn said. Kabwe’s new home was built in memory of Everett H. Jordan Jr., the former director of The Apprentice School who spent 44 years at Newport News, and Ron Nelson, a longtime Habitat construction supervisor. The men met in 2002 when the partnership with Newport News Shipbuilding and Habitat began, and they formed a friendship. Jordan and Nelson died in February 2018 and November 2017, respectively. The ribbon-cutting ceremony was followed by the ground-breaking of a new project less than a quarter mile away. In addition to being the 17th home Newport News will partner to build, it also will be Habitat’s 200th home. Habitat for Humanity Peninsula and Greater Williamsburg is a non-profit organization serving the cities of Hampton, Newport News, Poquoson and Williamsburg and the counties of Charles City, James City, New Kent and York. The local affiliate has built, renovated and repaired more than 250 homes since its founding in 1985. 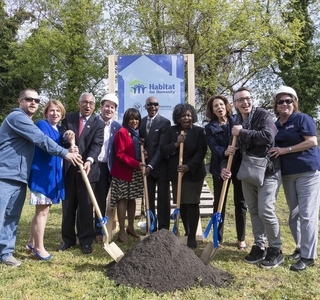 Habitat relies on building partnerships, volunteer labor, and donated materials to continue to produce safe, decent, affordable housing to homeowners with excellent credit, an income between 45-80 percent of the area median income, and the ability to pay for their new Habitat home. Homeowners purchase the new house with a no-interest, 20 to 30-year mortgage carried by Habitat. For more information, visit www.HabitatPGW.org.